Heat oven to 350°F. Line large cookie sheet with cooking parchment paper. 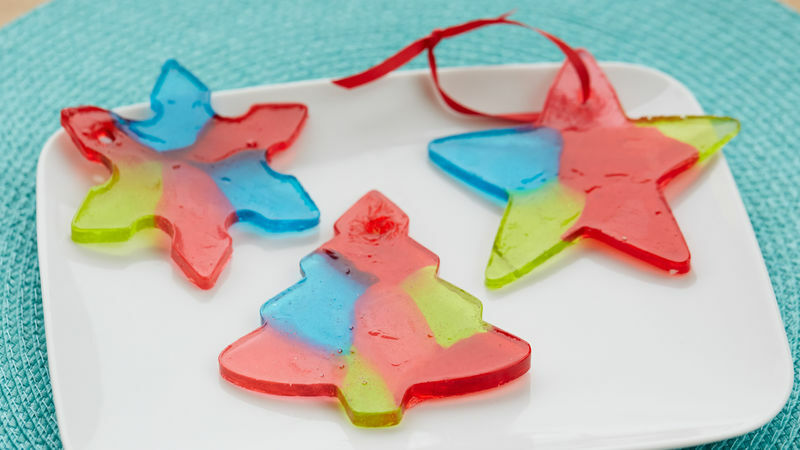 Spray insides of cookie cutters with cooking spray; place 2 inches apart on cookie sheet. Arrange 4 to 8 hard candies to fit in each cookie cutter. Bake 4 to 6 minutes or until candy is melted. Cool 3 minutes. Spray toothpick with cooking spray. With toothpick, make hole in top of each ornament. Cool completely in cookie cutter about 20 minutes or until hardened. Carefully remove candy ornament from cookie cutter, breaking any excess candy from outer edges of cookie cutter, if necessary. String ribbon through hole in ornament, and tie for hanging. Be sure hole is large enough to insert and tie ribbon in each ornament. Any rectangular or round hard candies can be used in this recipe.